← The brick and mortar opticians’ cabal. This weekend, I finished reading 1Q84, the latest Haruki Murakami novel. Murakami is considered “Japan’s leading novelist” and frequently described as an exponent of magical realism (or unrealism). I also remember reading somewhere recently that he is known for his detailed descriptions of food and cooking; indeed, I relished the spare descriptions of his characters’ simple meals. Something that seems less discussed in the realm of Murakami commentary is fashion: I noticed in 1Q84 many references to clothing brands or luxury labels. What’s more, these references were to ’80s-era, Japan-centric fashions that I’m less familiar with. So naturally, I turned to the Internet to fill me in. Most notably, the novel contains several long scenes wherein the main character, Aomame, is dressed in a green miniskirted suit by Junko Shimada. Aomame consciously re-wears this outfit at certain points in the book, so I really wanted to be able to visualize it properly in my head. I follow fashion casually, but I was not familiar with Junko Shimada – turns out, as the Internet has exhaustively parroted, she was one of the first Japanese designers to work and show in France, opening her first boutique in Paris in 1984. Unfortunately, there are not a lot of easily-findable photos online of her early work (StyleBistro seems to have the most complete, easily-navigable archive of Junko Shimada collections back to spring 2001; Elle also has photos of her more recent collections). 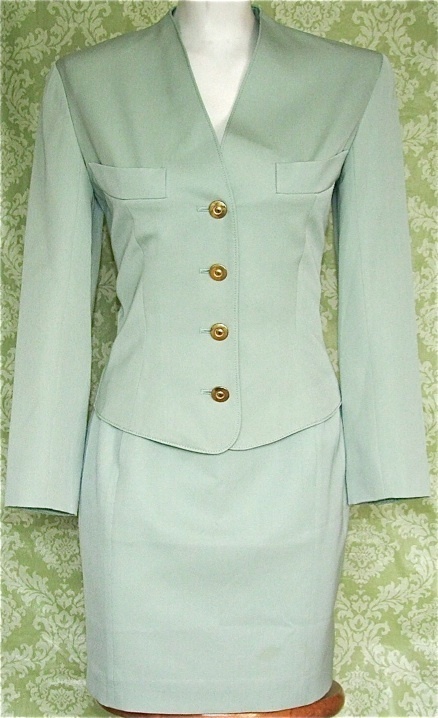 Aomame pairs this suit with “chestnut-colored Charles Jourdan heels.” Like these? Bland, bland, bland. I guess the look suits the character, who, when not dressed in unremarkable yet expensive designer clothes, favors sweats and jersey knits. Other labels favored by Aomame include Calvin Klein, Bagagerie, and Ferragamo. In contrast, note that another character, Ayumi, dresses more daringly in Commes des Garcons accessorized with a Gucci bag. She [the dowager] wore a beautifully cut dress of unfigured pale green cloth (perhaps a 1960s Givenchy) and a jade necklace. Midway through the meal, the manager appeared and offered her his respectful greetings. Vegetarian cuisine occupied much of the menu, and the flavors were elegant and simple. By coincidence, the soup of the day was green pea soup, as if in honor of Aomame. The dowager had a glass of Chablis, and Aomame kept her company. The wine was just as elegant and simple as the food. Aomame ordered a grilled cut of white fish. The dowager took only vegetables. Her manner of eating the vegetables was beautiful, like a work of art. “When you get to be my age, you can stay alive eating very little,” she said. “Of the finest food possible,” she added, half in jest. Murakami, Haruki (2011-10-25). 1Q84 (pp. 132-133). Random House, Inc.. Kindle Edition. Setting aside the cultural baggage that comes with brand names, I like the fashion references in 1Q84 because they are specific and concrete signposts that help the reader better visualize the novel’s universe. It’s the kind of detail that serves realism well, and Murakami does a great job with it in this novel without turning it into an overt commentary on materialism. The outfit is perfect. The shoes, however, are not was was in style in those days (for younger women). I had Charles Jourdan shoes, several pair. I wore that type of shoe from the late 70’s to late 80’s, when the style changed. I used to work in a bank and wore those type of shoes everyday. The shoes that were the most popular were pumps, high heels, three to four inches high, stilettos, with pointy toes, but not as pointy as 90’s shoes. They were very comfortable shoes because they were made of fine leather, including the sole of the shoe. I would say that in today’s shoes they would be similar to Manolo Blahniks but more subdued, meaning not as pointy and not as high. They also made beautiful high heeled sandals, very comfortable. Also perfect, according to my imagery, is the outfit for the dowager. 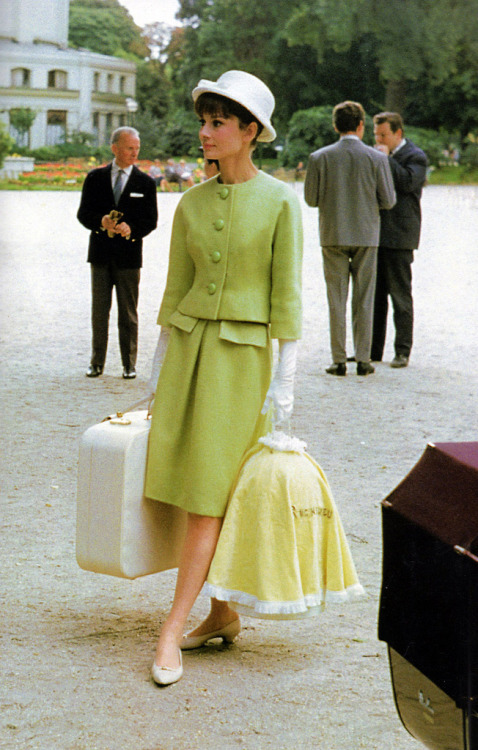 Pictures of Jackie Kennedy also come to mind. Tragedy, your photo of the Junko Shimada suit was linked to ebay, so now it’s gone. The suit is great! The shoes, however: If you are talking about her opening outfit, she was wearing pantyhose, remember? So prob. not open-toe shoes. Re: your comment on “blandness” – Aomame doesn’t want to be conspicuous. While Ayumi, a policewoman, wears uniform at work, so naturally she is more adventurous off-duty. I do remember that she was wearing pantyhose! But I thought it also said that her shoes were open-toed? I remember thinking it was an unfortunate combination, but I could be mis-remembering.